Supplementary material reads: "Gershon. City desk. Illus. Eb phants. Eight baby elephants ranging from 9 months to 2 years arrived here yesterday on boar [sic.] the American President Line freighter President Harding. They were consigned to Noel Rosefelt, president of Catalina Wild Life Expeditions. Rickey Johnson, 8, son of Capt. 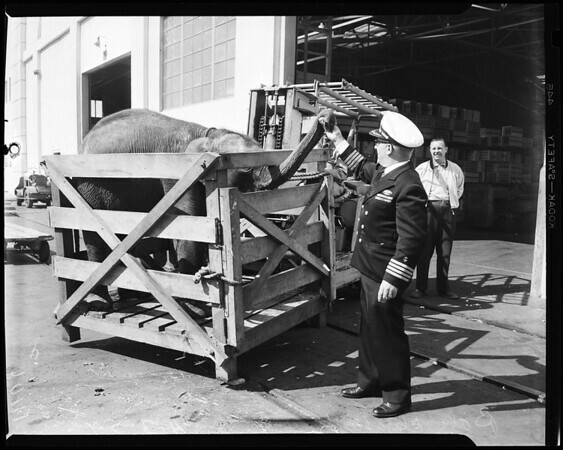 Carl Johnson, skipper of the President Harding was on hand and had an 'elephant show of his own' when he was permitted to feed, pet and ride the pachyderms. His father also joined in the fun. 'Tuffy,' one of the babies didn't like his crate and is shown in several efforts to climb out".